(CNN) - Sen. John D. Rockefeller IV, the five-term Democrat from West Virginia, opening up a potential seat for Republicans to grab in the next round of Congressional contests. "As I approach 50 years of public service in West Virginia, I've decided that 2014 will be the right moment for me to find new ways to fight for the causes I believe in and to spend more time with my incredible family," Rockefeller said in a statement. "Championing those most in need has been my life's calling, and I will never stop fighting to make a difference for the people who mean so much to me," he continued. First elected in 1984, Rockefeller is the chairman of the Commerce, Science, and Transportation Committee, and also holds a seat on the select intelligence, taxation, and veterans' affairs panels. His great-grandfather was the oil billionaire John D. Rockefeller, who at one point was America's richest man, and other relatives played major roles in the American banking and philanthropic communities. 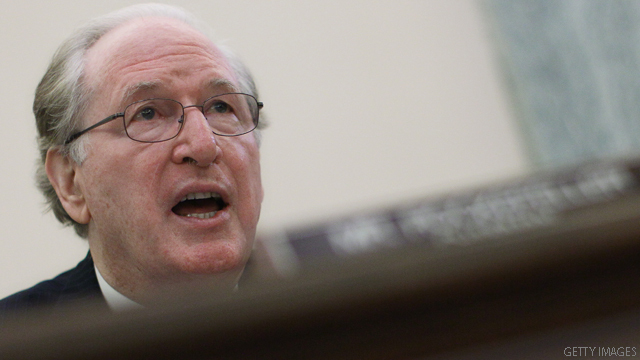 "Jay Rockefeller first arrived in West Virginia as a young volunteer, eager to improve the lives of working families. And for more than four decades, he has continued to fight tirelessly on their behalf," said President Barack Obama in a statement, praising his "impressive" legacy advocating for education, miners' safety, Social Security, and affordable healthcare. "Michelle and I join the people of West Virginia in thanking Senator Rockefeller for a lifetime of service." Republican Rep. Shelley Moore Capito, the seven-term West Virginia congresswoman, announced in November she would run for Rockefeller's seat in 2014. "The Senate has been stalemated – hasn't made progress and I believe I can contribute to moving forward, working together and solving the problems and I think it's a great opportunity for our state quite frankly," Capito said in her announcement at the state capitol in Charleston, according to CNN affiliate WSAZ. Capito represents West Virginia's second congressional district, which stretches from the panhandle outside Washington, D.C., west to the state capital of Charleston. She was first elected in 2000. While West Virginia's two senators are Democrats, and its governors have been Democrats going back to 2001, the state has long voted for Republicans in presidential elections. A Democratic source acknowledged Friday that their bench of potential candidates for Rockefeller's seat wasn't deep. While West Virginia's two senators are Democrats, and its governors have been Democrats since 2001, the state has long voted for Republicans in presidential elections. A Democratic source acknowledged Friday that their bench of potential candidates for Rockefeller's seat wasn't deep. Sen. Michael Bennet, the Colorado Democrat who chairs the Democratic Senatorial Campaign Committee, was optimistic in a statement, writing he was "confident we can elect an independent-minded Democrat to [Rockefeller's] seat next November." "Democrats maintain nearly a two to one voter registration advantage over Republicans in West Virginia and I know there are a number of leaders there who will consider taking this next step to serve their state," Bennet said. Democrats currently hold a 54-45 majority in the Senate. One independent senator – Sen. Angus King of Maine – also caucuses with Democrats. Thirty-five Senate seats will be open for re-election in 2014 - Democrats will be defending 21 of them, while Republicans will defend 14. CNN's Sam Feist and Paul Steinhauser contributed to this report. Jay, please run again–still there are no term-limits. Till then please do run. We love you. Rockefeller, eh? This guy's wealth makes Romney look like a pauper. Yet the left loves him... odd. "One independent senator – Sen. Angus King of Maine – also caucuses with Democrats"
Shelley Moore Capito believes that she can change the Senate? She either has no idea of how influence goes in the Senate (you'd figure that she would know that isn't the case being in the House) or has a very large ego and expectations of what she can do as 1 of 100 members of the Senate. Good riddance. For some reason, probably due to some childhood experience, this guy has been ashamed of his last name. So he has been trying to compensate by becoming the opposite of his legacy, a socialist Democrat. Yet, during his tenure the state has lag behind all other states in income, education and growth. The reality is that the real Rockefeller created more jobs, wealth and opportunities through his business and philanthropy for more people in this nation than his descendants have done as Democratic politicians trying to do the opposite. I see that the CNN Political Unit does not like to post comments that are TRUE!!! Why doesn't the mainstream media report on the FACT that the Rockefeller and Rothschild families funded both sides in WWII? Why is there a Rothschild Masonic Temple in Jerusalem? Is that too much to ask CNN Political Unit? Wonderful news for that state. Another worthless liberal Senator who inherited everything but wants to tax us all to death.